While many companies focus on criteria such as throughput and print resolution when selecting a thermal printer, factors like how quickly/easily a printer can be integrated, how rapidly media can be loaded, and how easily the printer can be serviced have an even greater impact on operational costs. Even small improvements in operational efficiency can positively affect a facility’s equipment up-time or ontime labeling performance. The SATO CLNX Series industrial thermal printer, available in a 4” (CL4NX) or 6” (CL6NX) model, was engineered with problem solving features in mind. 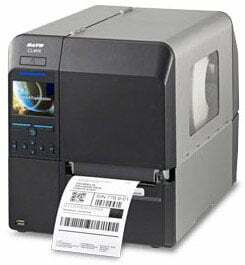 SATO’s goal was to engineer a thermal printer that is easier to integrate, operate, and maintain. If a printer requires a lot of configuration, jams frequently, produces poor quality labels, or is difficult for operators to quickly change out labels, ribbons, print heads or platen rollers, the downtime can be costly in terms of both productivity and expense.